The bestselling, beloved classic on how to go into the dark side of yourself to bring out the light -- now with new material. Debbie Ford believes that we each hold within us a trace of every human characteristic that exists, the capacity for every human emotion. We are born with the ability to express this entire spectrum of characteristics. But, Ford points out, our families and our society send us strong messages about which ones are good and bad. So when certain impulses arise, we deny them instead of confronting them, giving them a healthy voice, then letting them go. It is to these feelings that Ford turns our attention, these parts of our selves that don't fit the personae we have created for the rest of the world. She shows us the effects of living in the dark, of keeping all our supposedly unsavory impulses under wraps. We find ourselves disproportionately frustrated and angry at the selfishness of friends, the laziness of colleagues, the arrogance of siblings. When we are unable to reconcile similar impulses in ourselves, Ford explains, we waste our own energy judging others instead of empathizing. But most important, we deny ourselves the power and freedom of living authentically. 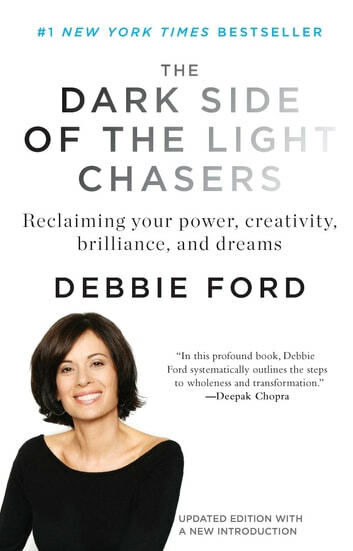 Through the stories and exercises in The Dark Side of the Light Chasers, Debbie Ford shows us not only how to recognize our hidden emotions, but also how to find the gifts they offer us. This is for fans of Marianne Williamson, Neale Donald Walsch, and Deepak Chopra. The very impulses we most fear may be the key to what is lacking in our lives. Debbie Ford does a wonderful job of explaining how to acknowledge those feelings that have been labelled as 'negative'. To acknowledge them, and to release them. Which is so much more healthy that trying to suppress them. It opens the door to a more relaxed outlook on life. It can help you to understand the actions of others, and see those action in an empathetic way. I strongly recommend this book - read it, do the exercises. And don't hold back. Book is not my cup of tea.Only got to chapter 6 and had to put it down.Did not feel good about going back and reflecting on my deepest dark place ever....Don't even think I have one.Maybe its just me.I love being myself the way I am.